Cut through a variety of surfaces with the wheel saw attachment. Powered by the carrier’s high-flow hydraulics, the wheel saw cuts through asphalt, concrete, and other materials to produce a trench for installing utility lines. The trench cleaner, which is raised and lowered hydraulically, assures a clean trench for installation. Use the hydraulic depth adjustment gauge to deliver a consistent, uniform cut depth. For operating close to curbs and walls, the hydraulic side-shift allows the attachment to shift flush with any nearby object for a close cut. When you’ve got tough ground to cut through, it’s easy to accidentally damage the site you’re working on, but with Bobcat’s precision built, easy-to-operate wheel saws, it’s impossible to make a mistake at work. Bobcat built their wheel saws just like they built all their other top of the line equipment. They use only the highest quality materials and parts on the market to put together the strongest attachments that will last for years of hard work to come. These Bobcat genuine wheel saws feature hydraulic side shift and depth adjustment, carbide tipped wheel bits, side cutter teeth, skis, and more. You can even keep track of your hours and clean out trenches with Bobcat’s most innovative features on this attachment. Operate with minimal damage to the surrounding jobsite and eliminate the mess of excavation. The wheel saw attachment provides a more precise cut than air or hydraulic hammers and is easier to transport than dedicated machines. Applications for the wheel saw attachment include cutting trenches for installing water, gas, electrical, utility, and fiber-optic cable lines. Other applications include preparing for repairing pavement as well as cutting through asphalt, rebar, concrete, frozen ground, and wire mesh. The wheel saw is the ideal attachment for road repair crews and rental facilities. Carbide-Tipped Bits: For longer tooth wear, bits are carbide-tipped for maximum uptime protection. Hydraulic Depth Adjustment: Depth gauge provides for uniform depth control while cutting. 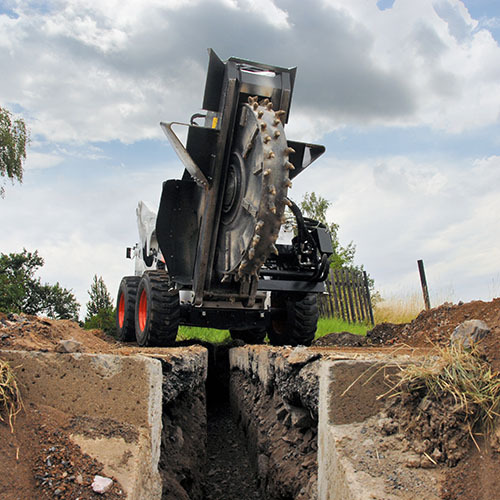 Hydraulic Side-Shift: For operating close to curbs and walls, the hydraulic side-shift allows the attachment to shift flush with any nearby object. Side Cutter Teeth: Reduce wear to the side of the wheel. Skis: The full length of the skis provides maximum stability and cutting accuracy. Spoil Deflectors: Push milled materials away from the trench, delivering a clean trench for installation. Stands: To improve an operator’s ability to attach and remove the wheel saw, storage stands raise the skis when the attachment is not in use. Trench Cleaner: Hydraulically controlled, the trench cleaner ensures a clean trench is left behind when operating the wheel saw.